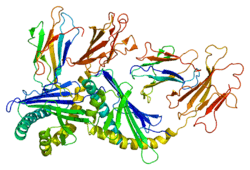 1 2 "P15813 (CD1D_HUMAN)". Uniprot. Retrieved 1 March 2013. ↑ Franck, Richard W. (1 January 2012). "C-Galactosylceramide: Synthesis and Immunology". C R Chim. 15 (1): 46–56. doi:10.1016/j.crci.2011.05.006. PMC 3293403 . PMID 22408579. ↑ Zhou, D (August 2006). "The immunological function of iGb3". Current Protein & Peptide Science. 7 (4): 325–323. doi:10.2174/138920306778018007. PMID 16918447. ↑ J. Kerzerho; E. Yu; C. M. Barra; E. Alari-Pahissa; E. Girardi; Y. Harrak; P. Lauzurica; A. Llebaria; D. Zajonc; O. Akbari; A. R. Castaño (2012). "Structural and functional characterization of a novel non-glycosidic iNKT agonist with immunomodulatory properties". Journal of Immunology. 188: 2254–2265. doi:10.4049/jimmunol.1103049. PMID 22301545. 1 2 Terabe, Masaki; Berzofsky, Jay A. (2008). "The Role of NKT Cells in Tumor Immunity". Adv Cancer Res. 101: 277–348. doi:10.1016/S0065-230X(08)00408-9. PMC 2693255 . PMID 19055947. Melián A, Beckman EM, Porcelli SA, Brenner MB (1996). "Antigen presentation by CD1 and MHC-encoded class I-like molecules.". Curr. Opin. Immunol. 8 (1): 82–8. doi:10.1016/S0952-7915(96)80109-9. PMID 8729450. Joyce S (2001). "CD1d and natural T cells: how their properties jump-start the immune system.". Cell. Mol. Life Sci. 58 (3): 442–69. doi:10.1007/PL00000869. PMID 11315191. Sköld M, Behar SM (2003). "Role of CD1d-Restricted NKT Cells in Microbial Immunity". Infect. Immun. 71 (10): 5447–55. doi:10.1128/IAI.71.10.5447-5455.2003. PMC 201095 . PMID 14500461. Balk SP, Bleicher PA, Terhorst C (1989). "Isolation and characterization of a cDNA and gene coding for a fourth CD1 molecule". Proc. Natl. Acad. Sci. U.S.A. 86 (1): 252–6. doi:10.1073/pnas.86.1.252. PMC 286442 . PMID 2463622. Yu CY, Milstein C (1990). "A physical map linking the five CD1 human thymocyte differentiation antigen genes". EMBO J. 8 (12): 3727–32. PMC 402056 . PMID 2583117. Martin LH, Calabi F, Milstein C (1987). "Isolation of CD1 genes: a family of major histocompatibility complex-related differentiation antigens". Proc. Natl. Acad. Sci. U.S.A. 83 (23): 9154–8. doi:10.1073/pnas.83.23.9154. PMC 387093 . PMID 3097645.